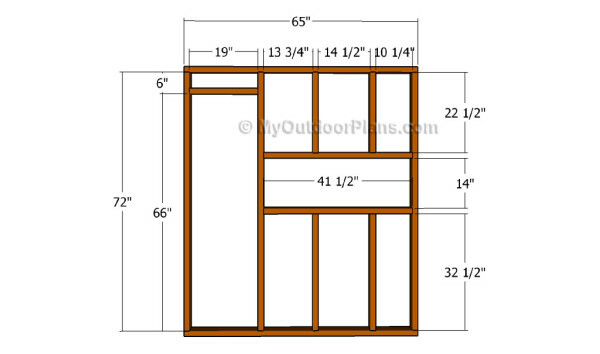 This step by step project is about a 6×6 deer blinds plans. 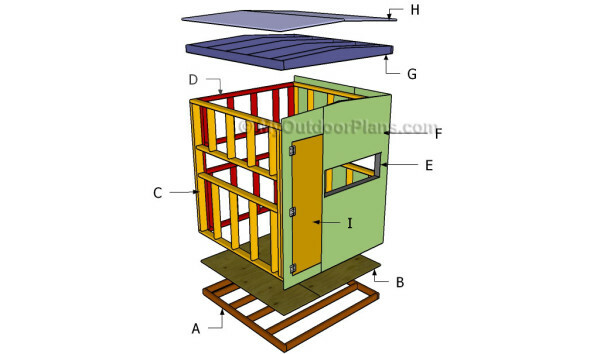 This article features detailed plans for building a 6×6 deer blind using common materials and tools. 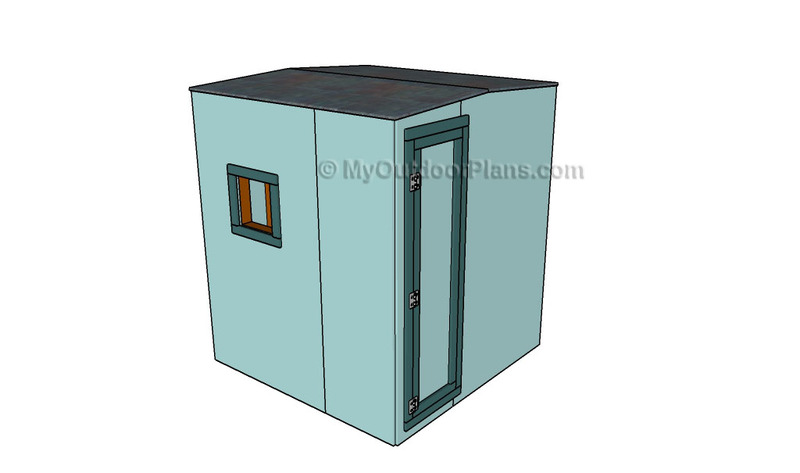 The structure is sturdy enough to support several persons and have windows on all side. Make sure you study the related plans, as there are several options to choose from when starting the final assembly. 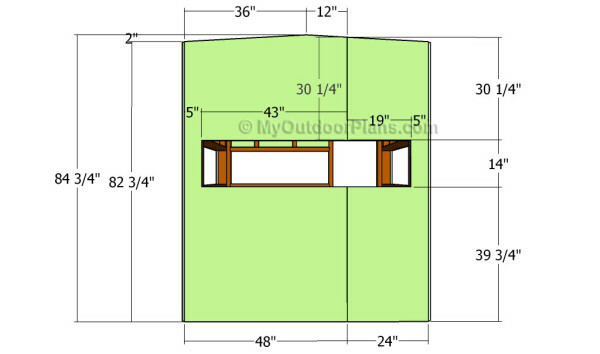 Check out our plans for a 4×8 deer blind, as well. 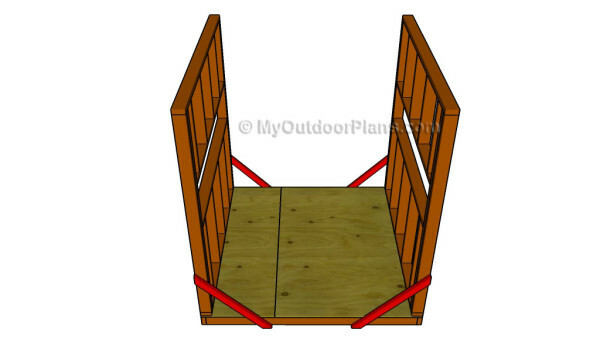 It’s that simple to build a 6×6 deer blind! The first step of the woodworking project is to build the frame of the floor. 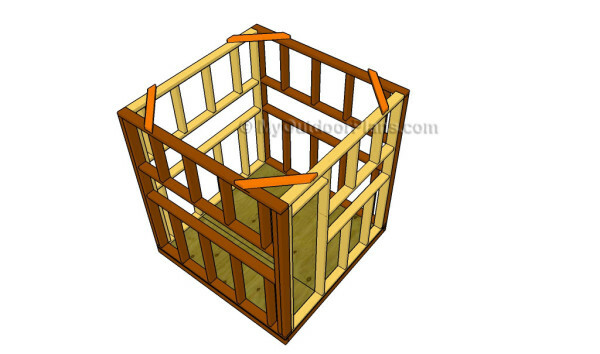 In order to get the job done in a professional manner, we recommend you to cut the joists out of 2×4 lumber. Cut the components at the right size and smooth the edges with sandpaper. Drill pilot holes through the perimeter joists and insert 2 1/2″ galvanized screws into the regular joists. Make sure the corners are square and place the joists equally-spaced. The next step of the woodworking project is to attach the plywood sheets over the floor frame. Cut the 3/4″ plywood sheets at the right size and secure the edges with sandpaper. Top Tip: Make sure the edges are flush and drill pilot holes before inserting the 1 1/4″ screws, to prevent the wood from splitting. 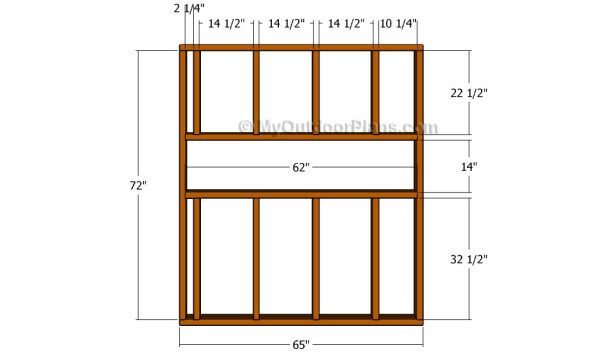 Insert the screws along the joists every 8″ and leave no gaps between the sheets. Continue the project by building the side walls. In order to get a professional result, we recommend you to cut the component out of 2×4 lumber. Drill pilot holes through the plates and insert 2 1/2″ screws into the studs. Makes sure the corners are square and leave no gaps between the components. Plumb the studs with a spirit level and make sure the plates are horizontal. Frame the windows as in the diagram. 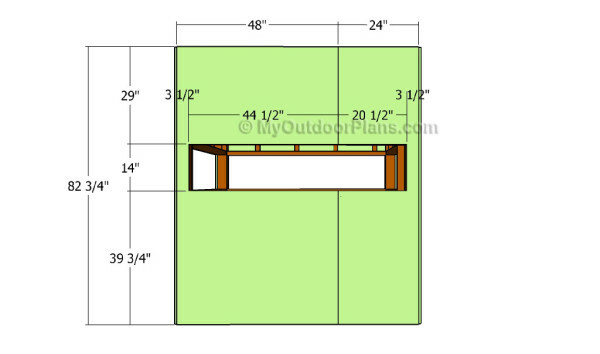 The next step of the outdoor project is to secure the side walls to the floor of the deer blind. Ask a friend to move the walls to the floor and secure them temporarily with braces, after plumbing them with a spirit level. Top Tip: Drill pilot holes through the bottom plates and insert 3 1/2″ screws into the joists. Leave no gaps and make sure the walls frames are flush with the floor. The next step of the project is to build the front wall of the deer blind. 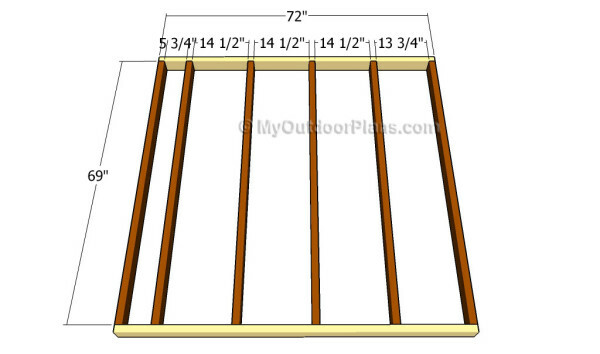 As you can notice in the diagram, we recommend you to build the components out of 2×4 lumber. Drill pilot holes through the plates and insert 2 1/2″ screws into the studs. Make sure the corners are right-angled and leave no gaps between the components. 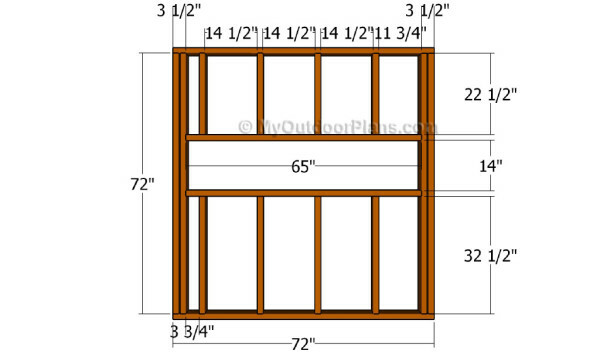 Frame the window for the deer blind and make adjustments if necessary. One of the last steps of the framing project is to build the back wall of the deer blind. 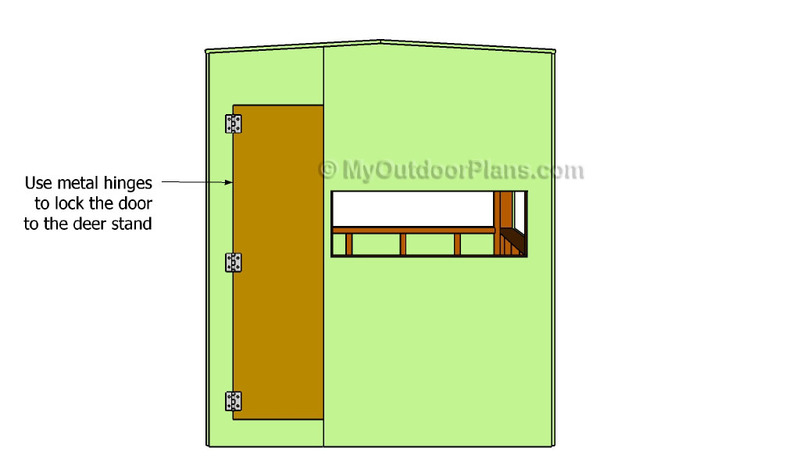 In order to have access to the hunting blind, we recommend you to frame the door, as described in the diagram. Work with attention and check if the corners are square. Drill pilot holes through the components before inserting the screws, to prevent the wood from splitting. Leave no gaps between the components. 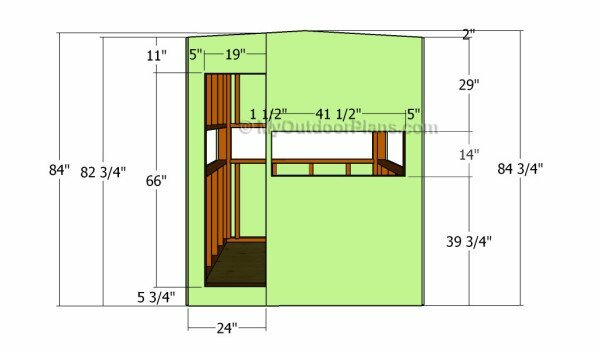 The next step of the woodworking project is to attach the front and back walls to the floor of the deer stand. As you can easily notice in the diagram, we recommend you to make sure the corners are right-angled. Drill pilot holes and secure the adjacent walls together, by inserting 2 1/2′ screws. Drill pilot holes through the plates and insert screws into the joints. Use braces to lock the walls together tightly. After assembling the frame of the 6×6 deer stand together, we recommend you to attach the exterior walls to the structure. Mark the cut lines over the 3/4″ plywood sheets and get the job done with a circular saw. Smooth the cut edges with sandpaper and remove the residues with a vacuum. Drill pilot holes and secure the sheets to the frame using 1 1/4″ screws, along the studs and plates. Next, attach the plywood sheets to the face of the 6×6 deer stand. In order to get a professional result, we recommend you to leave no gaps between the components and to cut the top at an angle. Smooth the edges with sandpaper before locking them to the structure. Afterwards, attach the exterior walls to the back of the structure. 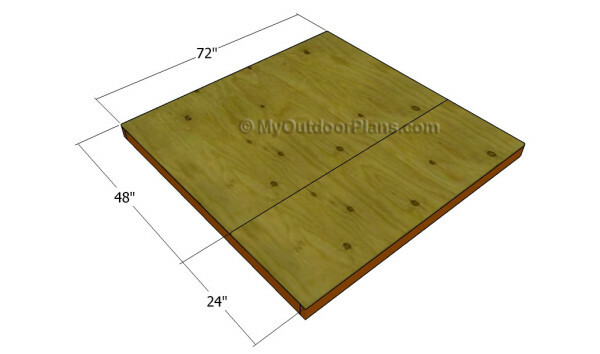 Make the cuts to the 3/4″ plywood sheets and align them into place, as described in the diagram. Smooth the edges with sandpaper and secure it into place by using 1 1/4′ galvanized screws. Top Tip: Apply several coats of stain or paint to enhance the look of the deer stand and to protect the components from decay. 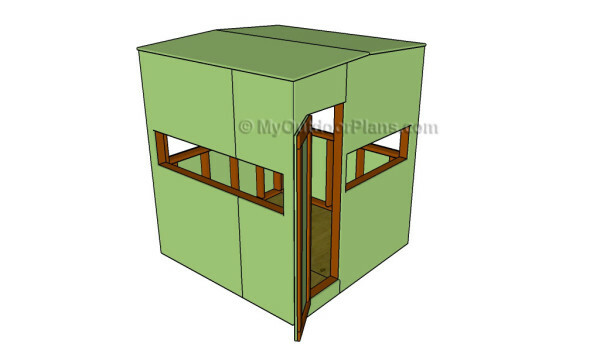 Check out the rest of the projects to see how to build the roof and the door. This project was about free deer blind plans. If you want to see more outdoor plans, we recommend you to check out the rest of the projects. Don’t forget to share our projects with your friends, by using the social media widgets. Submit your projects to inspire other readers. Just wanted to point out that on part E of materials it says that you need 2 pcs @ 65″ and 3 pcs at 65″. After looking over the image of the layout for E it looks like it should be 2 pcs at 65″ and 3 pcs @ 72″. I believe this is right please correct me if I’m wrong. Also looks like step E only needs 2-22.5″ and 2-33.5″ instead of the 3-22.5″ and 3-32.5″ as stated in materials. Thanks for the plans they’re great! Just trying to make sure that I get all the correct cuts. Thank you for pointing that out. I made the adjustments to the cut list. I always recommend that the people using my plans should also take a look over the measurements in the diagrams before making the cuts, as these small typing errors are inherent. I am looking forward to seeing the end result of your work! Pretty much finished. Just have to put the tarp on and it’s good to go! Thanks for the plans it came out great. Plan to put an actual roof on it before next season. thanks for the plans. I’m in the process of building it right now. That’s great! Good luck and I’m looking forward to seeing how it goes for you. Keep me updated with the progress. Where can I download these plans? I do not see a way to do it on here? I would like to have them and not have a computer in my garage to do it. How much will this cost to build, including the roof? The cost of materials vary according to location. You have the materials list so you can easily add up the costs for each item. Going to try this out. Just bought the wood at Lowes last night and got it all measured and cut. Laid the platform out and the spread of joists. Ready to screw together. Thank ya. Good luck with the project and don’t forget to let me know how it comes out. It would be awesome if you take a few pics as well. How much was the materials at Lowes Gary? I love this plan. I am going to build it for next season. Question Though! Is there a reason for the plywood siding not lining up on stud for support? Where doesn’t it line up on the studs? It has a pitch. It’s not a flat roof. Was reading through the material list, and was wondering what the metal connectors were? What are they used for? To secure the rafters to the frame (rafter ties).